As the days grow a little shorter and we descend into the depths of winter, having a deliciously warm blanket to rug yourself up in makes all the difference. 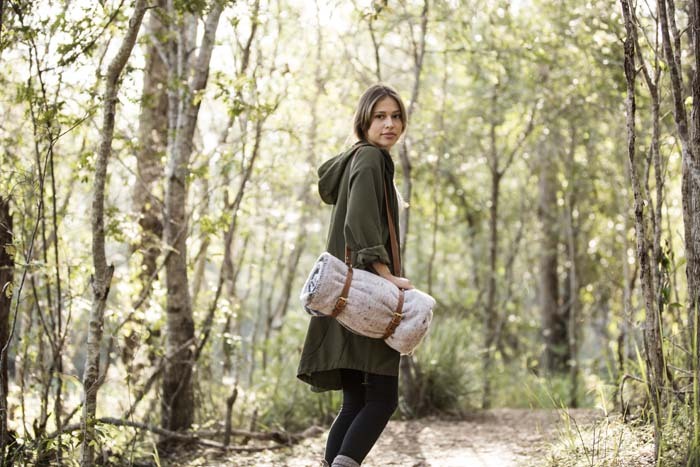 Sisters Karina and Sam Seljak are making their mark on the business world – and making sure there are no marks left on the environment – with Seljak Brand, the purveyors of fine woollen blankies. We spoke to Sam about starting up Seljak Brand and what it’s like having a closed loop business. Seljak brand is a business my sister, Karina, and I started. It is focused around circular economy methodologies: the idea that resources should be used in a circular way, not a linear way. We developed a circular model to create blankets out of recycled wool. Our blankets are made at a mill down in Tassie, who process all of the waste from their factory floor and spin it into yarn. And our blankets are woven with that yarn. 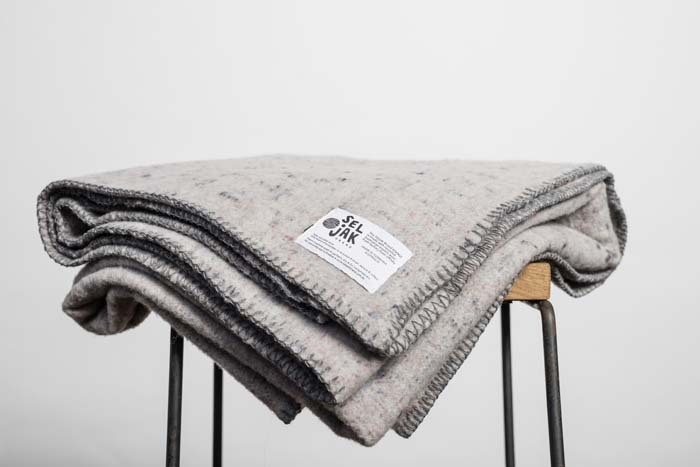 They’re a minimum of 70% merino (Australian merino), so the blankets are still really soft and luxurious, and the remaining 30% is kind of whatever is on the factory floor. It could be a bit of alpaca, a bit of mohair and also a little bit of polyester for strength. How did you create a closed loop business? The way we’ve been able to close the loop is by creating a collection service, so at the end of their life we’ll pick up the blankets free of charge using Sendle, which use a carbon neutral courier service. And then we’ll take them back to the mill to shred them and spin into new yarn. In that sense the blankets are entirely circular. Nothing will ever end up in landfill. What has been the journey of starting the business? We were down at a festival [Panama] in Tasmania and mum and my grandma both knew about the mill we now use because it’s a bit of an Australian institution. It’s the oldest mill in Australia, started in 1874, still at the same location. We visited their outlet store in Launceston, but the mill isn’t open to the public so we contacted them and started talking about our ideas and decided to visit the mill a couple of months later. In the meantime, Karina and I went to India. We both finished our full time jobs and went to India for three months. We visited weaving villages and weaving communities in India and learnt about weaving, but we didn’t learn how to weave. We were able to see how handloom works and what weaving is in its purest form. The mill in Australia uses machinery for mechanical looms, but it was really great to get an understanding of how a product is woven or how a fibre is treated and spun into a yarn and then woven into a product. What was it like being in India? We did see some pretty sad working conditions and that’s just what we were shown, so I can’t even imagine what else exists there. But we were really careful—we did a lot of research and reached out to organisations that we knew had ethical practices in place. We spent about five days with one weaving community in the far north east of India and they were weaving handloom Airy silk. It was a women’s cooperative and they had been commissioned by some Australian girls to weave fabric for their fashion line, which is how we found them. One of the girls from Melbourne was over there. Their company is called The Fabric Social and they’re a social enterprise in its truest form–empowering women at a really grassroots level. I think part of going to India was also seeing the benefits of micro financing and how a company can benefit people on the other side of the world. Why is sustainability and the choice of ethical brands important to you? I think it’s really important because every time we spend money, wherever we go, we vote with our dollar. So if you’re putting your money into the right things, change can be made in the world. And we wanted to be able to create something that people knew was something that wasn’t furthering harm on the environment or supporting bad working practices or unethical treatment of workers. In that sense it’s really important, because I feel that if you’re starting a business in today’s world there are so many issues with the world you may as well focus on one or a couple of them as part of your business model. Follow the Seljak Brand story over on their instagram @seljakbrand or on their website. For every ten blankets sold a blanket will be donated to the Asylum Seeker Resource Centre.